A broken wire or a loose bracket hurts your mouth and delays treatment. 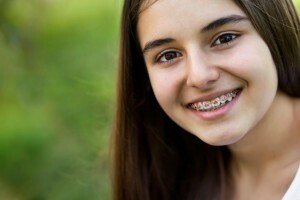 Contact Robison Dental Group immediately about your Canton, MI braces. Aligning your teeth for that perfect bite and winning smile takes some complex treatment. Should your Canton, MI braces break, learn what to do by calling Robison Dental Group right away. Plus, discover self-care techniques to avoid future fractures. While the traditional metal wire and bracket braces from J.D. Robison DDS at Robison Dental Group in Canton, MI are pretty durable, accidents happen. Sometimes, a blow to the mouth during sports (even when wearing a mouthguard) or chomping on some fibrous food, such as celery, can dislodge a bracket or fracture a wire. What’s the right course of action? First off, call your Canton, MI orthodontist right away. Dr. Robison will advise you on how to take care of your appliances and mouth, too. It’s not uncommon for brackets to detach or loosen or for wires to dislodge or break. Here are some common sense tips to help you with your broken braces until you can speak to Dr. Robison. Put some orthodontic wax over a loose bracket or end of a broken wire. This soft material will temporarily secure the hardware in question and also protect tongue, cheek and gums from injury. Bands that completely surround teeth may dislodge. Don’t try to put them back on yourself. Wait for the dentist. If a metal wire comes loose from a bracket or band, try gently pushing it back in place with an eraser-topped pencil or cotton-tipped swab. Do not cut the wire. Rinse your mouth with salt water if your have sustained a small laceration or have a sore spot from dislodged hardware. Topical anesthetics such as Orajel ease discomfort. Use a clean tweezers to replace a ligature (rubber band). To keep eating the healthy foods you like, try cutting them into small pieces before consuming them. This avoids the twisting, crushing forces that create havoc with orthodontic appliances. Invisalign patients must be diligent about oral hygiene and about wearing their aligners 20 to 22 hours a day. Additionally, they must keep their routine appointments to receive the next sets of aligners, keeping their treatment on track. When concerned about the condition of your braces, contact the staff at Robison Dental Group. You’ll get the answers and the service you can trust to keep your smile under construction a healthy, comfortable way.